Former independent Delegate Watkins Abbitt endorsed Terry McAuliffe for governor on Wednesday during a tour of White Oak Springs Dairy Farm in Evington, Virginia. 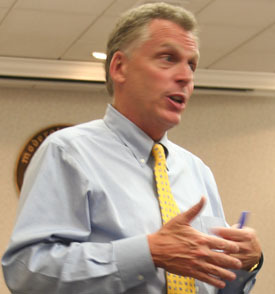 Abbitt, who served in the General Assembly from 1986 to 2012, cited McAuliffe’s mainstream focus on issues that will improve Virginia’s communities and economy as to why he is supporting McAuliffe. Abbitt lives in Appomattox and represented the 59th District during his tenure in the House of Delegates. He originally served as a Democrat, but switched to an Independent in 2001 and caucused with Republicans until his retirement in 2012. Throughout his career, he has been a leading advocate for conservation as well as Virginia’s hunting and fishing traditions. Abbitt is the latest of a series of Republicans and business leaders across Virginia who have joined in support for McAuliffe for governor–below is a roundup of others who have recently endorsed McAuliffe.